Players have until this Friday, November 1st to register for the upcoming Pro Qualification Tournament on KGS, scheduled for November 9, 10, 16 and 17. The event is open to US and Canadian citizens who meet a minimal residency requirement and have either an AGA rating or stable KGS rank of 5d or higher. Competitors should also be members of AGA or CGA. The winner will be invited to participate in the pro selection tournament in Los Angeles Jan. 2-8, receiving an $800 travel subsidy. Players can register for the tournament here. Upon registration players should also submit a copy of their US or Canadian passport. The residency requirement is that players have lived in the US or Canada for at least three of the last six years or else obtain a waiver from the AGA president based on their time overseas being temporary and for the purpose of education, go study or an overseas posting. 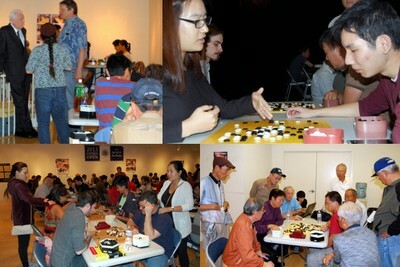 Anyone with questions about the tournament should contact Karoline Burrall Li at tournaments@usgo.org. Anyone with questions about pro selection or the residency requirement should contact Okun at president@usgo.org. 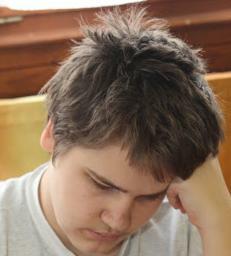 Slovenia: The 2013 Slovenian Championship finished October 20 in Fiesa with Gregor Butala 5d in first, Leon Matoh 5d in second, and Timotej Suc 3d in third. Norway: Also on October 20, Micael Svensson 1d bested Jakob Bing 3d at the 2013 Norwegian Championship in Oslo while Paal Sannes 3d placed third. Hungary: Dominik Boviz 4d (left) won the Visegrad Countries International Go Tournament in Budapest on October 20. Renato Tolgyesi 1d took second and Gyorgy Gsizmadia 4d came in third. 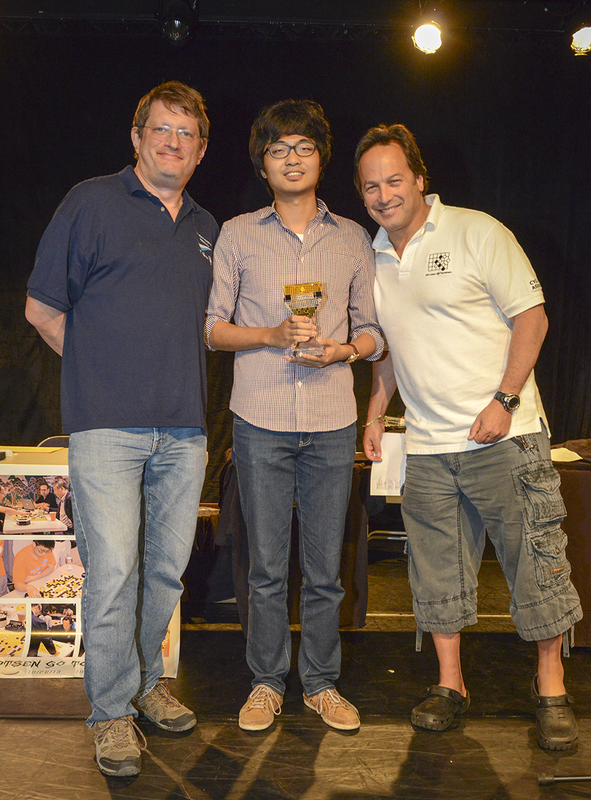 Beumgeon (Evan) Cho defeated Zhi Yuan (Andy) Liu in an edge-of-the-seat nailbiting Round 5 victory on Sunday to win the 2013 Cotsen Open. 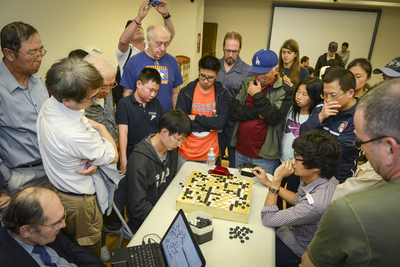 The thrilling last-round contest between the two undefeated players — Liu was going for a bi-coastal sweep after winning the Gotham Open earlier this month in New York City — drew a crowd in the Korean Cultural Center in Los Angeles as well as online where observers watched Myungwan Kim 9P’s live analysis of the game. 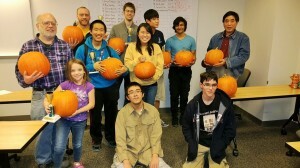 In third place was Eric Lui, Won Sik Lee took 4th place, Calvin Sun 5th and Andrew Lu 6th. Santa Monica won the $1,000 Club Champion prize, Orange County was second and Tucson third. In other division results, Anders Kierulf won Division A (4d-3d), Daniel Alvira won Division B (2d-1d), Jung Kang won Division C (1-5k), Gary Huang won Division D (6-11k) and Charles Polkiewicz won Division E (12k+). Click here for the final crosstab and see below for game records. photos: at right: Cho (center) with tournament sponsor Eric Cotsen (right) and AGA President Andy Okun; at left: the round 5 game. report by Chris Garlock; photos by Chrissy Hampton. 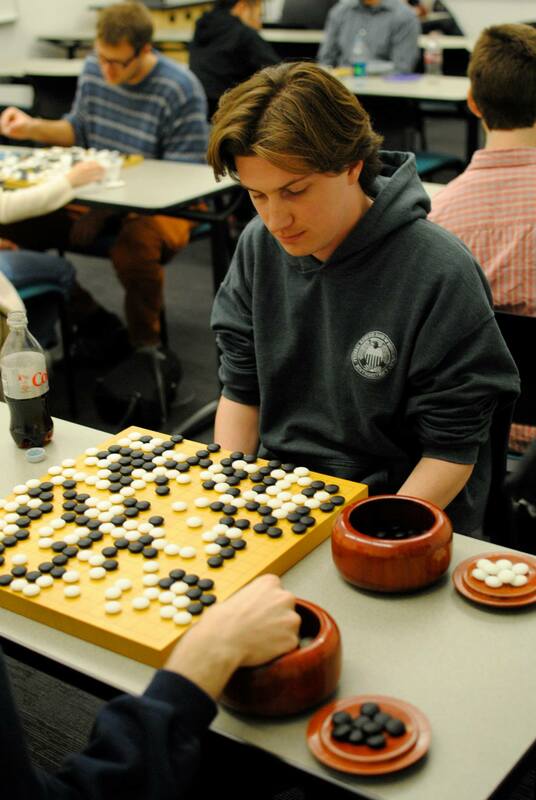 Before a single stone had been played at this weekend’s Cotsen Open in Los Angeles, two announcements drew sustained and resounding applause from the 140 gathered players. First was tournament sponsor Eric Cotsen’s confirmation that “funding has been secured for the next four Cotsen Opens,” guaranteeing the return of the popular annual event through 2017. 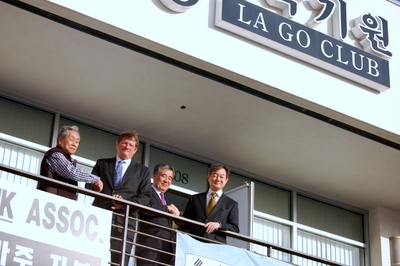 The second was Asian Go Federation (AGF) President Dae-won Suh’s announcement that plans are in the works for a Korean Baduk Cup in spring 2014, to be held, like the Cotsen, at the Korean Cultural Center. “I wish you all the best of luck,” said a beaming Suh. “Now let’s play baduk!” And with that, a day of fierce competition commenced over three hotly-contested rounds, broken only by a lunch break for free tacos from the food truck conveniently parked in the KCC parking lot, enabling players to enjoy a tasty lunch beneath clear Southern California skies before returning to the boards inside. Hundreds who could not attend the tournament followed the action live on KGS where the E-Journal team broadcast top boards, with pro commentaries on selected games. Leading the field are Beomgeun Cho, Andy Liu, Won Sik Lee and Eric Lui, all with 3-0 records (Click here for the tournament crosstab and see below for game records). The tournament continues Sunday with a pro-pro game on KGS starting at 8a PST between Yilun Yang 7p and Wang Qun 8p, followed by the final two rounds of the Cotsen. 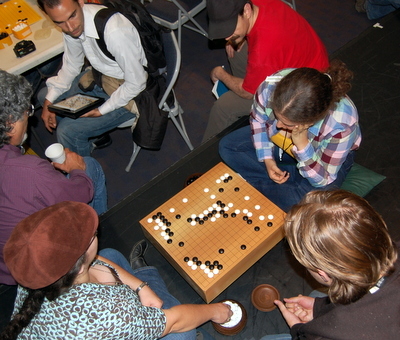 photo collage: top right: Haijin Lee 3p reviews a player’s game; bottom right: spectators gather around one of the top boards; bottom left: two masseuses — one of the Cotsen’s unique features — work their way through the field; top left: longtime go author Richard Bozulich (at left, talking to AGA President Andy Okun) dropped by for a brief visit Saturday morning while in town from Japan on a business trip. 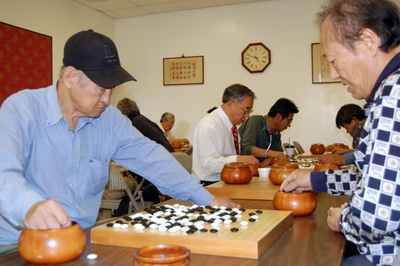 photo at left: Cotsen staff play a casual game. 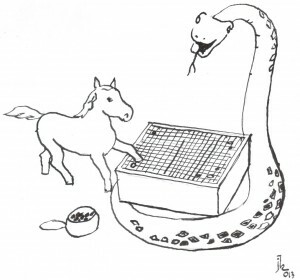 Your Move/Readers Write: What’s In A Name?